The Fourth shelf life is in fact about a draw located below stairs in the centre of the Print Department. It contains a selection of etchings by the Italian artist Federica Galli (Soresina, 1932 – Milan, February 6th 2009). Although we have a selection of Galli’s prints on display in one of our stands and also on the walls, unfortunately not all of them can see the light of day and some remain tucked away in this draw which has the rather unglamorous title of “CHF6.” This disguises the wonderful etchings, which await discovery inside. There is a link at the top of the article, which will allow you to view the contents of this draw in its entirety. One of the highlights from Federica Galli’s Venice etchings found within, is titled “Dalle Fondamenta della Tana,” (#11 in our online catalogue) which is an original etching signed by the artist, artist proof, 1983-1984. 492 x 297 mm. This print shows a traditional Venice backstreet with clothes hanging up to dry between houses. Galli has the ability to take you to a remote area of Venice and still make it seem very familiar. The majority of the etchings, which Galli produced from Venice, are not of the most famous sites, but show how Venetians themselves view the city. Galli spent two years producing her Venice series, spending most weekends in the city making her etchings. Another fabulous etching from the draw, taking the proud position of first listing in the Sotheran’s exhibition catalogue, is titled “Argine” (#1 in our online catalogue). This again is an original etching signed by the artist, edition 70/70, 1971. 636 x 346 mm. Galli was said to love trees for all of her life, etching them with great skill of observation, and with an understanding of the species distinctions. 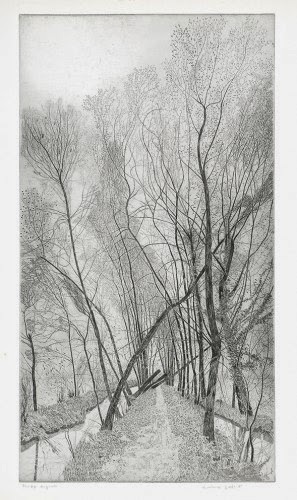 The long narrow path is lined by towering skeletal trees; veering in all directions whilst also being observed in the reflection of the small stream running the same course of the path. Galli loved to be outdoors and was very at one with nature, the people who knew her said that she thought of the trees as her friends. Galli’s trees appear entwined in conversation, and thus, the image is no longer a leafless wintry scene, rather a conversation amongst old friends. We have been fortunate enough to hold two exhibitions at Sotherans showcasing Federica Galli’s work, both on Trees (4th - 24th June 2013) as well as her Venice Series (21st June – 7th July 2012). The Venice Series was Galli’s first commercial exhibition in the U.K. and was considered a great success. Galli was relatively unknown in Britain at the time of the exhibition although the British Museum does have some of her work in their collection. She has been widely exhibited all over the world and we are very grateful to Fondazione Federica Galli and in particular Lorenza Salamon and Giovanni Gasparini for continuing to allow us to represent her in the U.K.